Angry Birds is the top-selling mobile game at the moment. Available for Apple, Nokia and Android devices, the game has been downloaded millions of times. 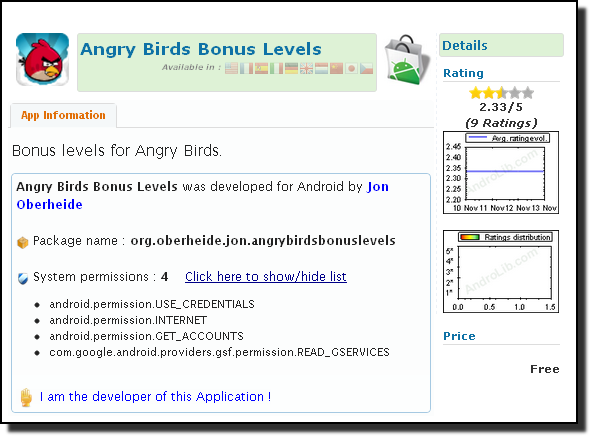 An application called Angry Birds Bonus Levels was uploaded to Android Market earlier this week. This application was not developed by the company behind Angry Birds (Rovio of Finland), but by researcher Jon Oberheide. Jon had discovered a security vulnerability in Android. This vulnerability would make it possible for one application to download and launch additional applications from the Market. 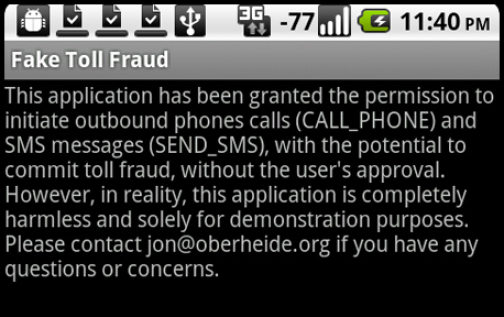 To demonstrate this, Jon had also uploaded several other applications to Market: Fake Contact Stealer, Fake Location Tracker, and Fake Toll Fraud. These would be launched by the Angry Birds trojan. In reality, these demonstrations applications did not do anything malicious. Also, there were no Bonus Levels either. Sorry. We do not know if Mr. Oberheide had permission to use the Angry Birds trademark in his demonstration. Google has removed these applications from the Market. To protect your Android phone against malicious attacks, take a look at F-Secure Mobile Security for Android.